Before shipping merchandise to Mexico, U.S. exporters are advised to secure the services of a licensed customs broker. Customs brokers are able to provide information on applicable duties and non-tariff regulations. More importantly, they are able to guide products through Mexico’s sometimes convoluted and confusing customs process in a timely and relatively hassle-free manner. The first thing a company must do before exporting to Mexico is make sure that the buyer is listed in the Importers’ Registry. This registry is filed with the Treasury Secretariat (Secretaría de Hacienda y Crédito Público, or ―Hacienda”). As an exporter, it is also important to ensure that the Mexican importer has submitted all the necessary information regarding packing, labeling, and quality standards (Mexican Official Standards or NOMs) to the Mexican customs officials. Customs brokers are limited in what they can do. Mexican import laws contain a number of restrictions and disclaimers that are unavoidable. Certain classes of merchandise are restricted or prohibited altogether if Mexico feels it must protect its economy and security, safeguard consumer health and wellbeing, or conserve the environment. In addition to customs restrictions stipulated by the Mexican tax authority, Hacienda, many other enforcement agencies and departments in Mexico’s federal government impose import restrictions, such as the Health Secretariat (Secretaría de Salud), the Commerce Secretariat (Secretaría de Economía, SE), the Communications and Transportation Secretariat (Secretaría de Comunicaciones y Transportes), and the Secretariat of the Environment and Natural Resources (Secretaría de Medio Ambiente y Recursos Naturales, SEMARNAT). For example: SE requires a special permit before used machinery can enter Mexico, and establishes import quotas for certain products; environmental permits must be obtained to handle or transport hazardous materials; and the Health Secretariat requires prior certification for importing products designed to have physical contact with the human body. Mexico also has an elaborate system of mandatory federal standards that must be complied with prior to import. One of the most important services that a customs broker can provide is the handling of paperwork, especially the all-important customs declaration. Customs declarations are not required for imports and exports involving foreign embassies and consulates, electricity, crude oil, natural gas, and personal effects. However, all other imports require the importer to present a written declaration under oath to customs officials and provide documentation that verifies the customs value of the merchandise. A copy of this declaration must be given to the customs broker or attorney-in-fact. The customs broker prepares the import documentation based on the information provided and pays any monies owed at a private bank located within Customs. The customs broker then presents the merchandise, along with the paid customs declaration, to the customs official. In addition to the customs declaration, a commercial invoice or pro forma invoice must be presented when the customs value exceeds US$1,000. The invoice should be prepared in Spanish; if not, a translation may be written on the reverse side of the invoice. The importing company must also provide the bill of lading or airway bill of lading, endorsed by the transport company, along with documents showing compliance with applicable regulations, proof of the country of origin, and if appropriate, the country of export. A payment guarantee must be provided to cover additional amounts that may apply if the declared value is less than the estimated price of the merchandise established by Hacienda. Special regulations govern the importation of samples and materials used for demonstration and promotion. When these goods are to be used at fairs, conferences, exhibitions, trade shows and conventions, they can be temporarily imported duty-free under Mexican customs law for a period of up to one year, as long as they are returned to their place of origin in the same condition in which they arrived. Such goods must be marked or otherwise identified according to their exclusive use at the corresponding event, and distributed free of charge. However, if the promotional material is to be sold at the event, it must be imported on a definite basis, meaning that all duties must be paid and all applicable regulations and non-tariff restrictions fulfilled. Only when goods are imported definitely can they be sold. If imported items are not marked to indicate the specific purpose of promotion, they must be returned to their place of origin immediately after the event. A packing list/slip must always accompany the shipment. This document allows the exporter, the transport agency, the insurance company, customs and the buyer to identify the goods to be imported. The information shown on the packing list/slip must agree with the description on the commercial invoice. The use of a packing list/slip guarantees strict control, permits identification of the complete shipment at any point, and provides a basis for registering complaints with insurance agencies in the event of damaged or missing merchandise. The dimensions of the box, parcel or pallet should also be included on the packing list/slip to aid in obtaining transport costs within Mexico. The certificate of origin attests that goods being imported have been manufactured or produced in a country that is party to a treaty or trade agreement with Mexico, such as NAFTA. If a certificate of origin is obtained, the goods receive preferential tariff treatment. This certificate must be presented with the shipment at the point of entry so that goods can receive preferential tariff treatment and the payment of compensatory quotas can be avoided. Various types of certificates of origin exist, depending on the origin and type of commodity. “Soft” certificates provide tariff preferences under free trade agreements and do not require a visa from the government agency responsible for issuing the documents in the originating country. “Hard” certificates of origin are those that must be verified by the authorities of the originating country. The importation of some types of goods involves the presentation of yet another certificate at the point of customs clearance. A free sale certificate must be issued in the merchandise’s country of origin. This certificate consists of a written declaration by the appropriate authorities in the country of origin, stating that the goods may be sold and consumed freely without exception, and that their sale does not require a special permit. The price actually paid or payable for imported merchandise shall be increased by the amount attributable to the above-mentioned items, yet only to the extent that each amount is not otherwise included in the purchase price and is based on sufficient information. If for any reason sufficient information is unavailable, the transaction value cannot be determined. Both during and after customs clearance, the Mexican customs office has the authority to declare that the customs value has not been determined correctly. Therefore, to ensure legal certainty and avoid future valuation problems, confirmation of the correct valuation of goods should be requested from Hacienda. Merchandise is unloaded from the pallet or container for preliminary revision by the contracted transporter, parcel service or customs broker. These agents verify that the packing materials and merchandise have not been altered. The customs broker or parcel service agent examines the goods and documents to determine the value of the goods for customs purposes, the dutiable status of goods, and whether to mark the goods with their country of origin or with special marking or labeling. He also checks for articles that must comply with non-tariff restrictions. 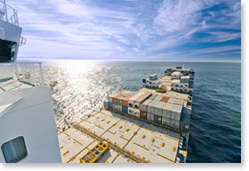 If the shipment contains articles that are prohibited in Mexico, the broker or agent ensures that the goods are correctly invoiced and not in excess of the invoiced quantities. If the merchandise passes all of these tests, it is prepared for customs clearance. All required documents are annexed to the shipment at this point. Once the corresponding import duties are paid, the merchandise is presented, with an entry summary, to customs officials. The entry summary is scanned into the Automated Manifest System to define if the authorities will examine the merchandise or if it will clear customs without review. A red light requires examination, while a green light means the goods have cleared customs without examination. The goods declared on the invoice are the same as those presented physically before customs. The declared customs value is correctly calculated. The Harmonized Tariff Schedule (HTS) number is correct. Regulations and non-tariff restrictions have been observed. Should customs officials detect any discrepancies, the authorities will levy the shipment and begin the PAMA process (Administrative Procedure in Customs Matters). If no problems are detected, the merchandise has cleared customs. All merchandise must pass through the Automated Manifest System a second time, regardless of the first outcome. Shipments may be examined again if a second red light occurs, or they may pass through without being examined in the event of a second green light. If a shipment is designated for review, the examination will take place within three hours. Time periods may be extended if discrepancies are detected. If the shipment is not designated for review, it will be released immediately so that it can proceed to its final destination. Mandatory standards required to import goods into Mexico are listed by HS code numbers. The products considered for this report are not subject to standards. However, standard NOM-EM-004-RECNAT-1996, states that all products imported inside of a wood crate or container, or products with wood packaging may be inspected at the point of entry to Mexico. This standard applies only to the packaging or container. need to contain specific information? Answer: Yes, its content must be specific. The invoice must include the place and date of issuance; the complete name and address of the buyer or importer in Mexico; the complete name and address of the exporter; a detailed description of the merchandise (relevant date on brand name, model, marks, serial numbers, etc. ); the unit value and total value of each item listed on the invoice; the signature, name and position of the seller; the shipper’s invoice number; and the customer’s order number. Question: what is the Harmonized Tariff System (HS)? Answer: The Harmonized Tariff System code numbers are numeric designations for specific types of products. These codes, adopted by virtually every country in the world, are used to identify goods subject to international trade. By using the codes, a country is able to assign tariff duties to specific types of products.